Bonus Two Book Friday on a Wednesday! While we were in the Pacific Northwest we hit up all the bookstores. A favorite was Green Bean Books in Portland where we grabbed these two awesome titles. First we have Moon, a beautiful book about a bored little girl who finds adventure. 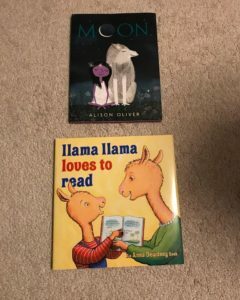 Also, we have Llama Llama Loves to Read, because reading is what it is all about, obviously.